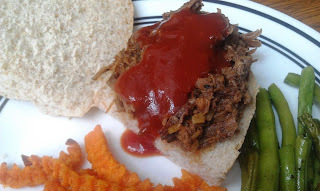 Give my husband a good sandwich with some homemade BBQ sauce and he is a happy man. 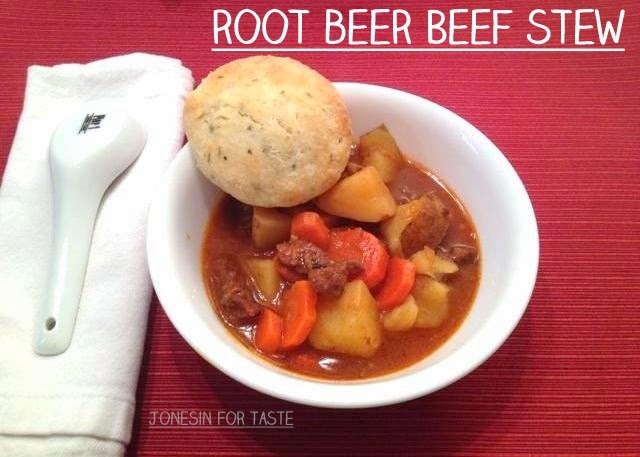 This is super tasty and I love that it is made in the crock-pot. No heating up the house, I don't even need to be home. Just perfect for when we will be gone playing but will be home to eat dinner. And the sauce on this is amazing. My hubby and I have agreed I just need to stop buying BBQ sauce because nothing can compete with a good homemade BBQ sauce. 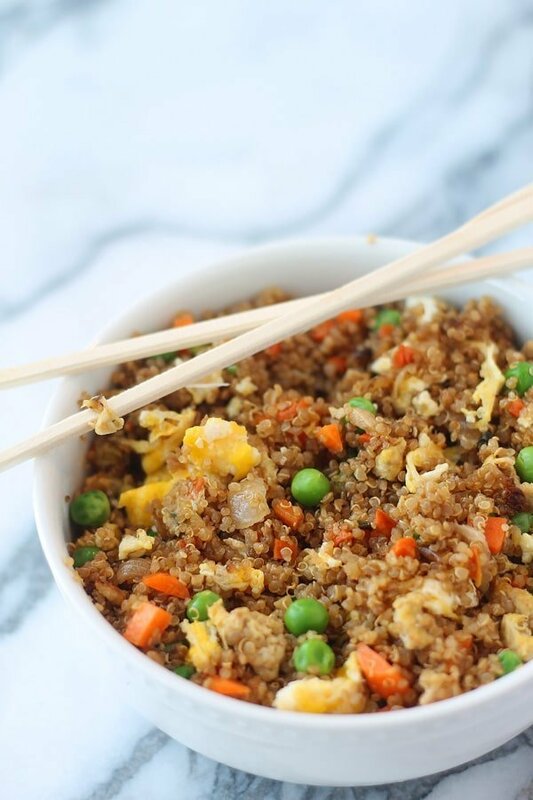 Serve this over rice, quinoa, or gluten free bread instead of the bun for a gluten free version. In a small bowl, mix together salt, pepper, and cayenne pepper. Set aside 1/2 tsp of the mixture. Rub the remaining mixture on the beef. In a large skillet, heat the oil over medium heat. Brown the beef brisket on all sides. Transfer beef brisket to crock pot. Add the Dr. Pepper to the skillet and simmer on low heat for about 2 minutes scraping up the browned bits. 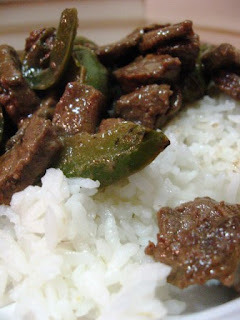 Pour the Dr. Pepper mixture over the beef in the crock pot. Cook on low for 7 to 9 hours. Shred the beef and transfer to a bowl and cover to keep warm. Pour the juices from the crock pot into a bowl or gravy separator. Skim off fat. Return beef to slow cooker and pour 2 cups of the juices onto the beef. Cover and keep crock-pot on warm. In a small saucepan, heat the BBQ sauce ingredients and the reserved 1/2 tsp spice mixture over medium heat. Stir 1 cup of the mixture into the beef, and reserve the rest. Split the rolls, mound the beef on top, and serve with the reserved sauce. Once upon a time I had coconut milk and got sick. I have avoided it for over 20 years but after seeing so many recipes that looked delicious I decided to give coconut another try. Man, I have missed so much deliciousness. Don't pity me for too long. I have been making up for my lack of coconut by having it often and savoring it completely. For my husband's birthday back in May we went through my cake board on Pinterest and I told him to choose one for me to make. 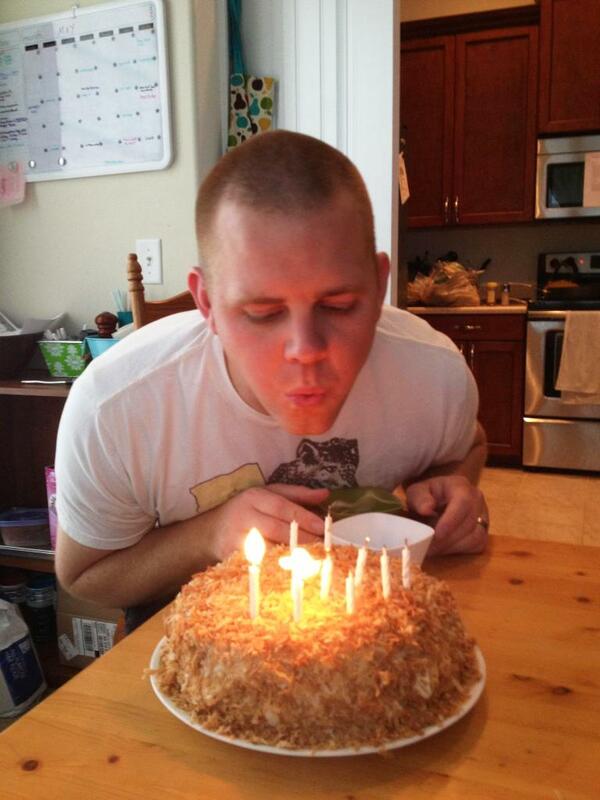 He had chosen a coconut cake but that recipe I had pinned was outrageous. It was supposed to soak for like 3 days and people said it wasn't that good anyways. Wow. So I was off to scour the internet for a new recipe. I finally found this particular recipe and we enjoyed every last morsel of that cake. We may have hidden the last big slice from the kids just so we could savor it one last time after they had gone to bed one night. Don't judge us, it's that good. And that last 1/4 cup of reduced coconut milk didn't go to waste. Look out for a delicious use for the rest of that milk. Isn't he handsome! Love that man! My daughter and I had lots of fun making this cake together. I served this pasta salad with the ribs I posted last week. My hubby digs on this salad and I love how versatile it is. I have made it with crab, tuna, shrimp, and just the plain ol' pasta salad. They all have been awesome and they all taste slightly different depending on what kind of seafood you add. 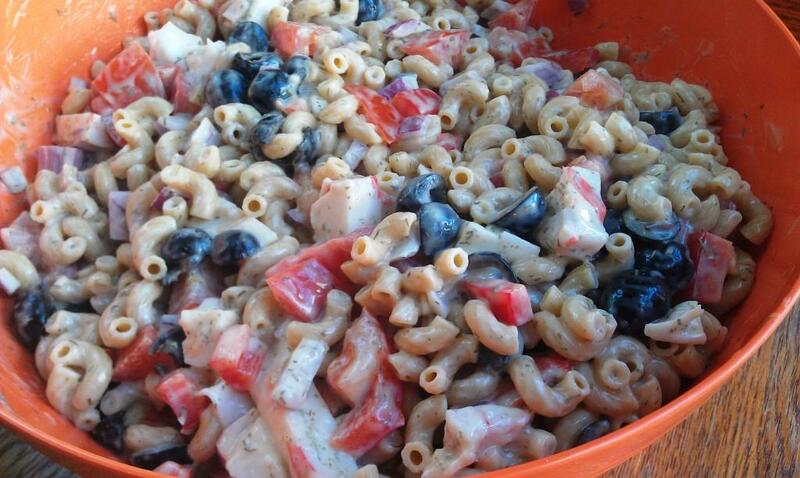 I use whole wheat pasta to make the salad a little more substantial (and healthy). I use Kraft mayo with olive oil instead of regular mayo because it is a little lighter and I love the taste of it so much more. I used to HATE mayo. Like don't bring that thing near me because I might gag kind of hate. But I tried the mayo with olive oil and decided I could like this mayo thing. And I do. In talking with my husband one day during dinner, he asked why I wasn't taking pictures of what we were eating. Ha ha, talk about the plight of a blogger's spouse always waiting to eat until your wife has finished taking pictures. 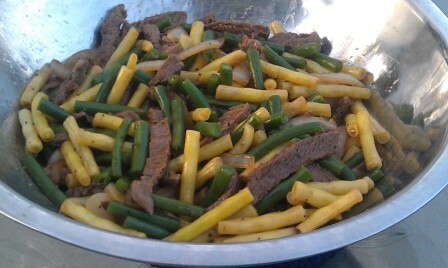 Any who, I informed him the meal I made was from a fellow blogger and I had made it as it, and loved it. I realized I need to be sharing these recipes. There have been a few recipes that I have tried that we have hated. Only one thus far was really awful but sometimes it can be hard to pick out the good from the bad. So I've decided that each Friday I will feature one recipe that we have adored and hopefully you will go check out that recipe from that blogger and enjoy their wonderful recipes, just as we have. Onto our first featured recipe. I made this last week and we enjoyed it immensely. 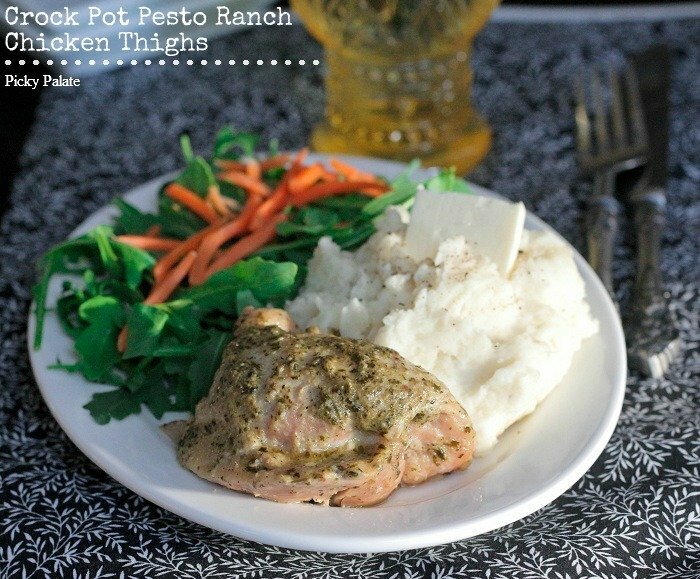 Absolutely delicious and a crock pot meal using just 4 ingredients. Few things are better than that. The only thing I changed was using boneless skinless chicken breasts. We love cooking outside but it is something we have not done much of since we have moved out here to Georgia. There are a lot of bugs! Like outrageous amounts of bugs and when the weather is nice enough to be outside the bugs are out in full force. But this summer has been so much nicer! We have actually been outside a few times. One day we were having our church's missionaries over for dinner but we had been busy all day and I realized I didn't have what I needed to make the dinner I had been planning on. I did have ribs in my freezer which I pulled out to thaw and knew exactly what recipe I wanted to make. This is my all time favorite way to do ribs. The spice rub on them is awesome! I have made this countless times and will make it countless more. I love the fact that there is no basting and essentially no turning. 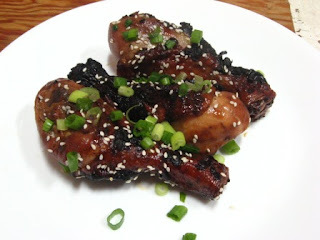 I turned them once in 2 hours and then twice more just really quick when I added the glaze on at the end. Low maintenance dinner during the summer is right up my alley! These can be made in the oven or on the grill. I have made them both ways and obviously cooking them on the grill just kicks it up a notch. So go make some killer ribs and knock the socks off the men in your life! In a small bowl combine oil and all spices. 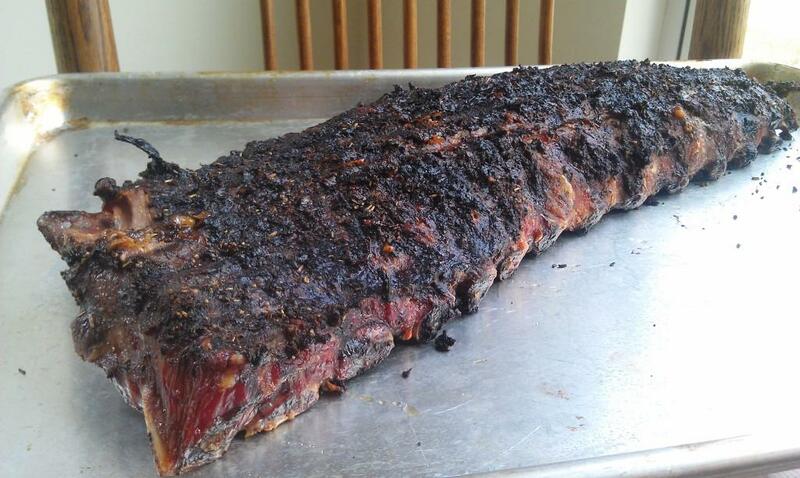 Rub spice paste all over ribs and let stand at room temperature for 2 hours (Or as long as possible. I always forget this step so it only sits out for 30-45 minutes. It's still delicious.) or refrigerate over night. During the winter I did lots of baking, especially muffins so that we would have breakfast on hand to add variety to our morning meals. Man, or child, cannot live on cereal alone. During the summer though the thought of using my oven for extended periods of time just makes me way too hot. So pancakes are a great alternative. My kids love them and these particular pancakes have become a staple. 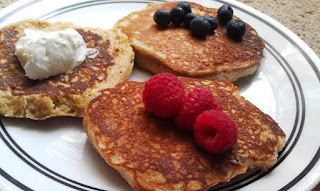 My hubby and I love them because they are delicious all on their own- no syrup needed. That's a good thing all around in my opinion. I like to make lots of different flavored ones- blueberry, strawberry, raspberry, peach, vanilla with chocolate chips, etc. There are so many possibilities because there are so many different varieties of yogurt. Sometimes I use Greek yogurt other times I use light yogurt. It just depends on my mood and what I have on hand. I've mentioned before how I have lots of fond food memories growing up. 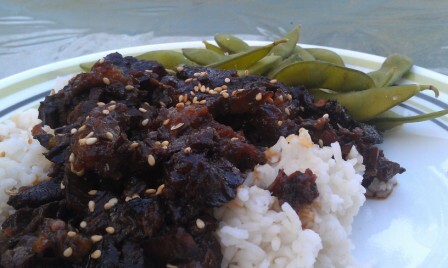 This is another one of those meals that I have great memories of. We would make these as a family right at the dinner table. My mom would set up the deep fryer in the middle of our table and we would each have a dumpling press and we would make a ton of these, frying them as we went. It was a lot of fun. My kids are too little to do this yet but you bet it will be something I do with my family. This makes a ton of wontons. 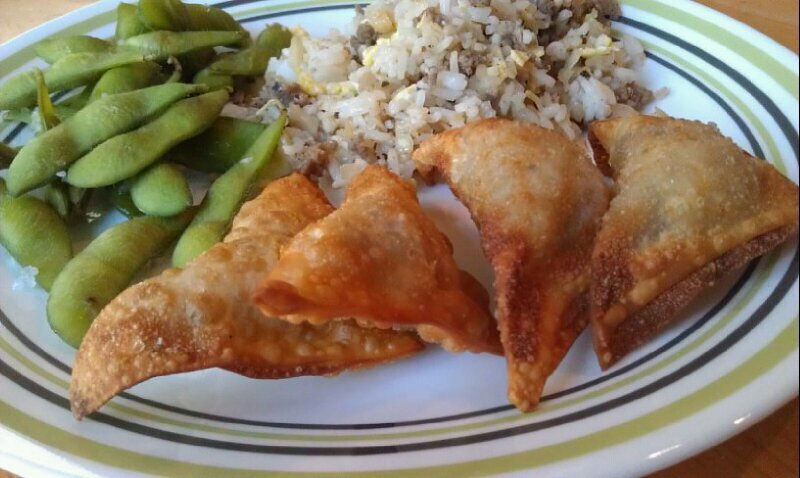 If you don't want to make the entire recipe into wontons, take about half of the pork mixture and make fried rice. Cook the pork mixture until browned and add leftover rice and scrambled eggs. Continue to mix it all together in the pan until heated through.